In the SPRINTS section of the BACKLOG page, above the list with existing Sprints, click . Note: If you have not added any Sprints yet, in the SPRINTS section of the BACKLOG page, click the You may want to create a new sprint in your project link to add your first Sprint. This action opens the New sprint form. On the New sprint form, enter the name of the new Sprint. Note: On the far right of the sprint name text box you can view the name of the last Sprint of the current project. Select a start date and an end date for the new Sprint; the start date determines the position of the Sprint on the Sprints list. 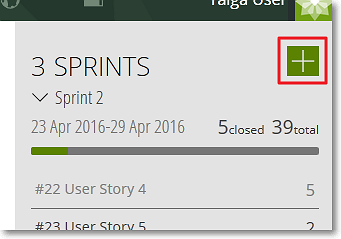 The new Sprint is added to the Sprints list and you can now add User Stories to that Sprint.